When I painted I had a distinct subject matter and style; always children, almost always in watercolor and colored pencil. My own children were my favorite subjects and I posed them a lot for photo reference shots. At first I painted in a small second floor studio space above a pharmacy that I shared with two other women artists, mainly on Friday afternoons when a neighbor would watch my children. Those were magical hours to me where I could express my individual creative vision and preserve my sanity as a stay at home Mom. In later years I had a “studio room” at home. As my kids grew older I did some commission work of other people’s children and occasionally took photos of friends’ kids for references, but my studio time became less and less. In truth, most of the time I didn’t miss it too much. I had gone back to school for a nursing degree (that first one in art really wasn’t going to pay the bills), gotten a job, and had a life full of activities and obligations. 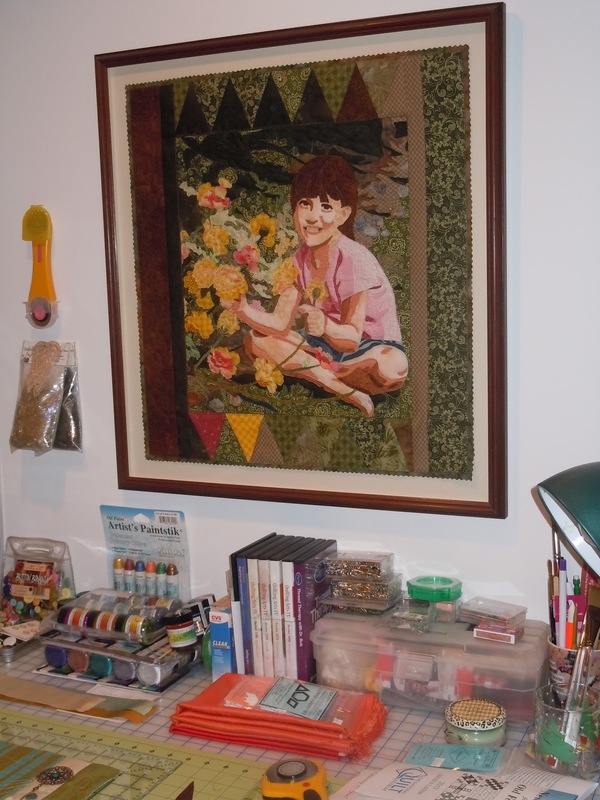 Then I started quilting as a creative hobby. It didn’t take long to discover that there was a quilt art world out there and I was fascinated by it. The possibilities! I read books, subscribed to magazines, bought fabric and gadgets of all kinds, took classes, attended retreats, traveled to major shows … and continued to make traditional type quilts from commercial patterns. I made one pictorial art quilt and framed it under glass! (You can take the watercolorist away from the paint but … 🙂 I think I had seen so many beautiful quilts that I let a little fear creep into my creative process. “I don’t know how to do it right“… “It doesn’t look like I want it to” … “Other quilters are so much better”. My voice had gotten lost in that very sea of possibilities that so initially inspired me. Conscious decisions and small steps (like this blog) are helping me to rediscover it. The “T For Two” challenge project with Candy is helping to take away the fear of trying something new – and maybe having it not work. After all, it’s just a little quilting among friends, right? So I’m going to keep at it and hope that months from now I’ll be able to showcase finished work that sings with my voice.